Featuring great looking car listing design with multiple page support and table reservation system. Homepage – Homepage contains a lot of options and it is easily adjustable. You can choose several options – big slider or static image, text box, 2 types of information boxes with small or large images, option to add content of some other websites at your homepage or to show the most popular offers. Gallery – This theme is has a separate gallery system. You can choose between two styles of galleries: fancy box and standard gallery. We have implemented a shortcode of gallery which enables adding a couple of first images to the post. Car Listing – It is a car catalogue which can be easily administered from the management panel. Reservations – The client can make a booking and administer, approve or cancel it easily. After the booking is reviewed the administrator can send an email to the client directly from the management panel. Blog – This theme offers everything you need for blogging, you can add avatars to your posts, automatic search of avatar from the post if it is not set. This is supplemented by one more slider which shows news from the Car Listing page. You can choose between two blog styles: a post with a large or small image. Widgets – This theme is offered together with 5 widgets adjusted for the theme. Shortcodes – This theme contains 25 shortcodes which can be inserted both by adding shortcode in the post field or by using specific shortcode insertion buttons which make using the shortcode much easier. 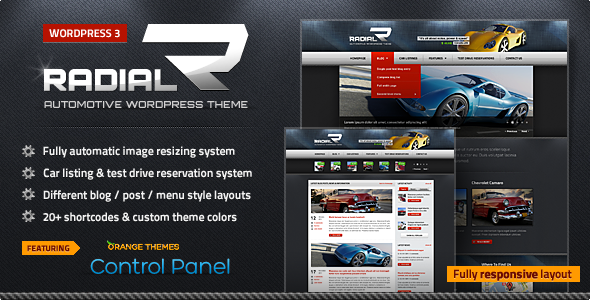 Share the post "Radial – Premium Automotive & Tech WordPress Theme"